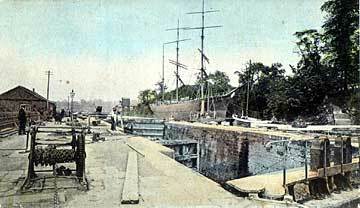 The old entrance to the canal at Sharpness was opened in 1827 but is no longer used. 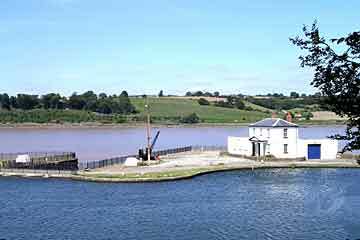 It comprised one pair of entrance gates, a tidal basin and two locks. 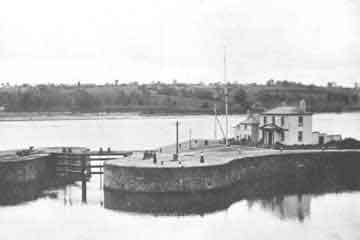 Because of the high tidal range in the river, vessels could only enter and leave the basin during a short period around the time of high water. The old entrance ceased being used in 1908, and the area became a neglected backwater. In the early 1990s, the old gates were damaged by a very high tide and were replaced by a dam which maintains the water in the basin well above its historic level. The former Harbour Master's house has become a base for the Severn Area Rescue Association, a group of volunteers who maintain inshore rescue boats ready to assist those who get into difficulties on the river. When the dam across the entrance raised the level of the tidal basin in the 1990s, the locks became redundant, although some of the gates are still in situ. 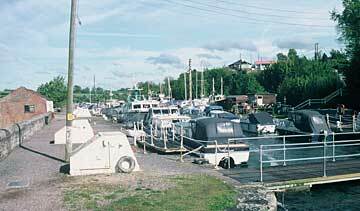 The locks now serve as a boundary for the Sharpness Marina in the Old Arm, where the training ship Vindicatrix was moored for almost 30 years. The trees on the extreme right are a reminder of the former Pleasure Grounds on top of the cliff, a popular destination for those travelling on the passenger steamers from Gloucester.